This past weekend, I had the wonderful opportunity to attend BlogHer. Now, the idea of spending a weekend with 3500+ women bloggers seemed a bit daunting, but I’m so happy I went. I have never been surrounded by so many intelligent, interesting, passionate, and welcoming women in my life–I learned a lot and made some great connections. But enough about that, let’s get to a few quick recaps! My roommate, Hilary, has the sweetest blog and cutest kid you’ll ever see. She and I got along fabulously, and she introduced me to the world of the mommy blogger. There are some incredible moms out there! Favorite party? Sparklecorn. As in a dance party named after a sparkly unicorn. 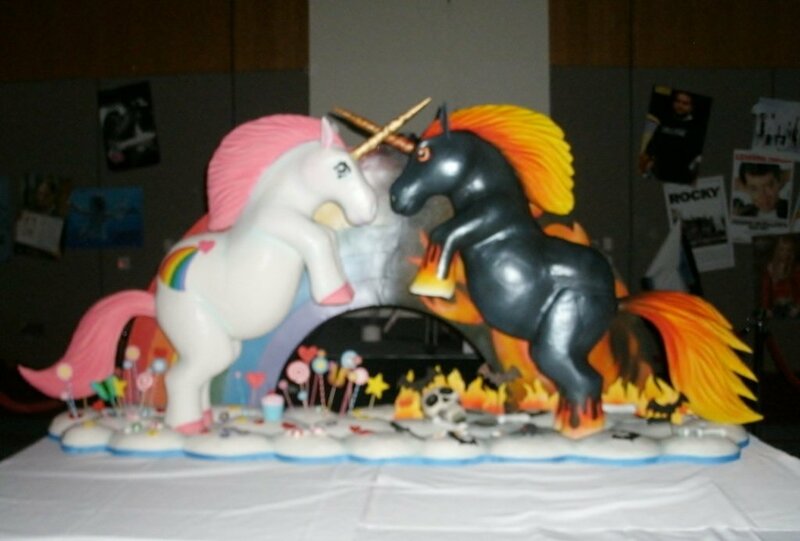 The cake was created by Charm City Cakes, and was THE COOLEST unicorn cake in the world. We mingled, ate the cake, and danced the night away with cardboard cutouts of the Harry Potter kids and Darth Vader. When the party ended, the young wizards needed a place to sleep. I was generous enough to let them share my bed. Thanks to BlogHer, I have some fun new things to share with you, AND some awesome giveaways! Be on the lookout for the first next week.